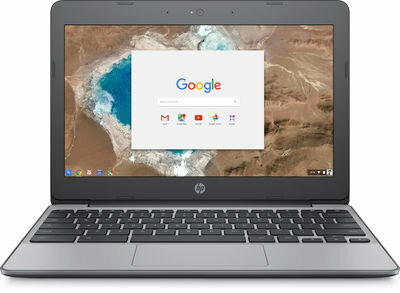 Bring this HP 11.6" screen Chromebook in anodized silver with you to class or to the coffee shop to help you take on the day's tasks when away from home. The laptop features 4GB of memory, a 16GB eMMC drive and Chrome OS to help you get things done, and Bluetooth® technology allows simple, wireless connections of peripherals. 11.6" screen provides beautiful HD graphics. Powered by Intel Celeron N3060 processor. Run multiple programs at once. 16GB eMMC drive offers plenty of storage space. Wireless-AC (802.11a/b/g/n/ac) technology provides cable-free Internet access. Bluetooth technology lets you connect Bluetooth-enabled devices up to 30' away. microSD™ card reader helps transfer files. 2 USB 3.1 ports for high-speed data sharing. Front-facing webcam offers HD video chatting. The slim design and 12 hours and 45 minutes of battery life1 give you attractive power and superb all-day portability, perfect to take along and show off wherever you go. With an 11.6-inch diagonal HD1 display, you can comfortably enjoy the view from any angle with perfect clarity and great video quality. 1 Testing conducted by HP using Google Chrome OS power LoadTest. Battery life will vary and the maximum capacity of the battery will naturally decrease with time and usage. See http://www.chromium.org/chromium-os/testing/power-testing for test details. 2 Features may require software or other 3rd party applications to provide the described functionality. Internet service required and not included. 3 Actual formatted capacity is less. Portion of internal storage is reserved for preloaded content. 5 Intel® Turbo Boost technology requires a PC with a processor with Intel Turbo Boost capability. Intel Turbo Boost performance varies depending on hardware, software and overall system configuration. See http://www.intel.com/technology/turboboost/ for more information. 12 EPEAT® Silver registered where applicable. EPEAT registration varies by country. See www.epeat.net for registration status by country. 14 Call 1.800.474.6836 or www.support.hp.com for more information on Care Packs available after 90 days. After 90 days, an incident fee may apply.